The following instructions are intended for users who are already familiar with the Colossus Piano App and who are interested in more in-depth topics regarding this app. If you are using Colossus Piano for the first time, then please refer to the introductional chapter of this manual first. Even if you are a serious, conservative composer, we really encourage you to also use the on-screen keyboard as well. You will be surprised how many new musical ideas pop up from your mind immediately, simply because the virtual keyboard automatically kicks you out from your usual mechanical playing patterns of a real MIDI keyboard! The previous chapter already described how to enlarge, shrink and scroll the virtual on-screen piano keyboard. For changing the appearance and behaviour of the virtual keyboard you need to unfold the keyboard's toolbar to get access to its additional buttons. To do so, simply tap on the right-arrow button to open the keybard's toolbar. One of the most important features of a real piano keyboard is the ability to control the general sound characteristics of individual notes by pressing down the individual piano keys with different velocities. So if you press down a key with a high velocity, the note would be loud and harsh, if you press the key gently the sound would be rather gentle and soft. To replicate this behavior appropriately on a touch screen is a technical challenge. There are two different ways to replicate such note velocities with the virtual on-screen keyboard, and the keyboard's toolbar allows you to switch between those two distinct behaviours of the keyboard. Touch Impact: In this mode, the virtual keyboard tries to emulate a velocity depending on how quickly your fingers hit the screen. This works with any iOS device, so it is not limited to iOS devices supporting 3D touch force. Please note though that the precision of the information, apps get from the operating system, reduced dramatically with recent iOS versions. That's why this is not longer the default behavior with Colossus Piano anymore. Vertical Touch Position: This is the default behaviour of the virtual keyboard, i.e. initially after installation of the app. 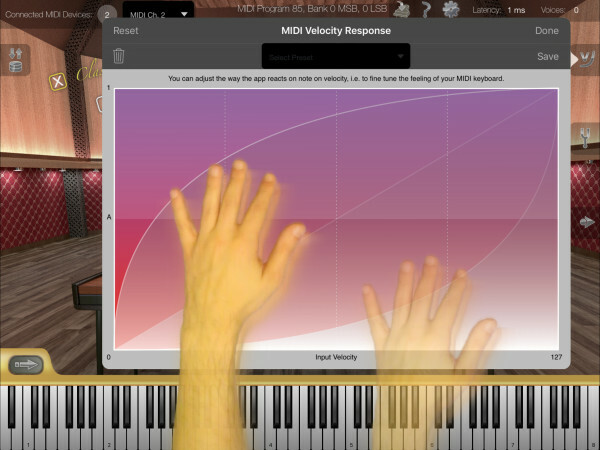 In this mode the virtual keyboard emulates a velocity information depending on the vertical position of your finger on the respective virtual piano key. Tapping on the bottom of a key generates a higher velocity, tapping on the top of a key generates a lower velocity instead. Another important aspect to control is the keyboard's transpose setting. By transposing with the selected amount of semi-tones or octaves, the notes you play will accordingly sound higher or lower respectively. This setting is actually not simply altering the transpose of the virtual keyboard, instead it actually transposes on engine level. That means when you change the transpose setting this way, also notes you play with an external MIDI keyboard for instance will also sound higher or lower according to the selected amount of semi-tones or octaves. To reset quickly all transpose setting to 0, tap both buttons simultaniously. The transpose setting affects not only the virtual keyboard, but also all other MIDI sources, like your external MIDI keyboard. Obviously, the previously described default behaviour is fine for many situations, especially when you are using the app for the first time, but it may not always be what you want. That's why you can also override this automatic selection of MIDI devices and instead manually pick only the ones you really want to use instead. 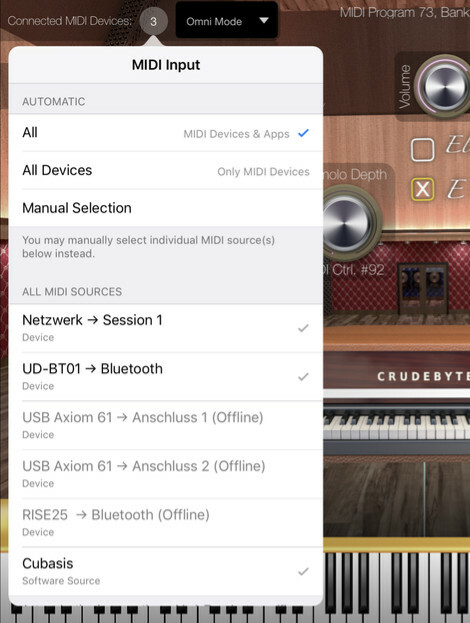 As you can see on this screen shot, the app allows you to select from any kind of MIDI source, not limited to only external MIDI hardware devices, but also third-party apps that may be running on your iOS device simultaniously. All MIDI sources with a check mark are currently connected with Colossus Piano. MIDI sources marked as "Offline" are sources which were previously available, but are currently not available to the operating system. So if you see your prefered, external MIDI keyboard displayed as being "offline", then please check the connectors, cables and adapters being involved. You may encounter that the number of external MIDI devices is showing 1 even though you have no external MIDI equipment attached to your iPad / iPhone at that moment. This is not an error. Usually that means you used iOS's so called Network MIDI feature before, which will remain visible like a regular MIDI hardware device for the entire system. If your external MIDI devices (or third-party apps) are displayed as being connected, and the app is still not reacting as expected by you, then please also check whether the MIDI channel setting is configured correctly. 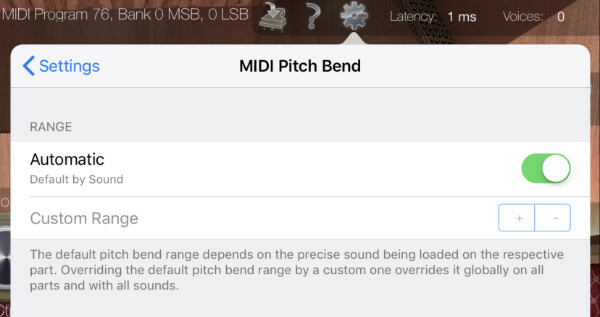 You may also use our free MIDI monitor app MIDI Wrench to check which external MIDI devices are exactly connected to your iOS device, and especially for checking what kind of MIDI events they are sending on which MIDI channel. This free tool is very helpful to resolve MIDI connection issues quickly and efficiently. The MIDI standard defines 16 so called "MIDI channels". That way it is theoretically possible to control up to 16 different apps or 16 different sounds simultaniously with only one MIDI connection. By default Colossus Piano is configured in Omni Mode, that means the app will simply listen to all MIDI channels. This default setting is especially handy when you use the app for the first time, because you don't have to care about which MIDI channel your external keyboard is currently configured to send on. At a later point however, you might want to use also other apps simultaniously, e.g. to create layered sounds with only one external keyboard or for defining zones on your keyboard where each key zone shall play a different sound. In this case you might want the Colossus app to only listen to one specific MIDI channel instead. 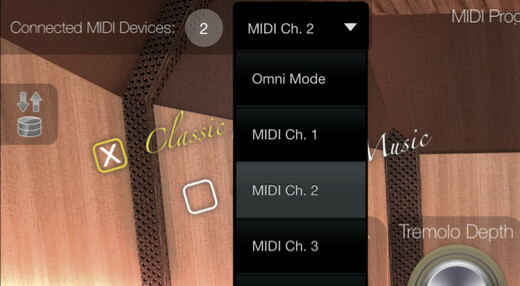 In so called Omni Mode the app will listen and react to all MIDI channels. In case you hear double notes (which usually sounds like a chorus effect) or hanging notes, then please make sure your keyboard is configured to send on one MIDI channel only. You may adjust the so called velocity response with the velocity response curve editor, as shown on the left. The velocity response curve defines the relation between MIDI note-on velocity values (0 ... 127) and the resulting instrument's volume (0% ... 100%). In other words: it controls the precise volume depending on how fast you trigger a key on your external MIDI keyboard. This is commonly used to adjust the feeling of individual MIDI keyboards according to your prefered playing style and taste. Simply place one finger onto the curve and drag your finger around on the screen to bend the velocity response curve to the desired shape. You hear the result of the velocity curve change as soon as you lift up your finger from the screen. You may save the current velocity response curve as preset by tapping on the "Save" button. A popup will appear on your screen: enter a name for the new preset and confirm saving the new preset. To restore a previously saved velocity response curve preset, select one preset from the combo box (available on the very top of the velocity response curve editor). As soon as you tapped on an item from the velocity response preset list, that preset becomes immediately audible. To restore the velocity response curve to its default setting (a neutral linear one), tap on the "Reset" button. The change becomes immediately audible. To delete a previously saved velocity response curve preset, select the preset with the preset combo box first, then tap on trash can button on the upper left side of the velocity response curve editor. Another common approach to control a sound in real-time is the so called pitchbend wheel, which allows you to continuously alter the pitch of the currently active notes by simply turning this dedicated wheel at your MIDI keyboard. So rotating this dedicated wheel on your keyboard makes the currently playing sound higher or lower in real-time. The pitch range of the MIDI pitch bend wheel is pre-assigned by us for each individual sound. For the majority of our sounds the default pitch bend range is ± 200 cents. (that is ± 2 semi tones). You can also override the pitch bend range on the app's settings screen. You may decrease it to only few cents, or rather increase it to a range of up to 2 octaves. For professional musicians, as well as for musicians of non-western musical genres, scales and frequency tuning settings is a must-have feature. All aspects of tuning involved in Colossus Piano are available from the dedicated tuning screen which you can reach by tapping on the small tuning fork icon. Please note that in contrast to many other music apps, Colossus Piano not only provides static scale tuning, but also dynamic scale tuning, and the app's tuning screen makes a clear distinction between those two different types of adjusting the tuning of individual notes. 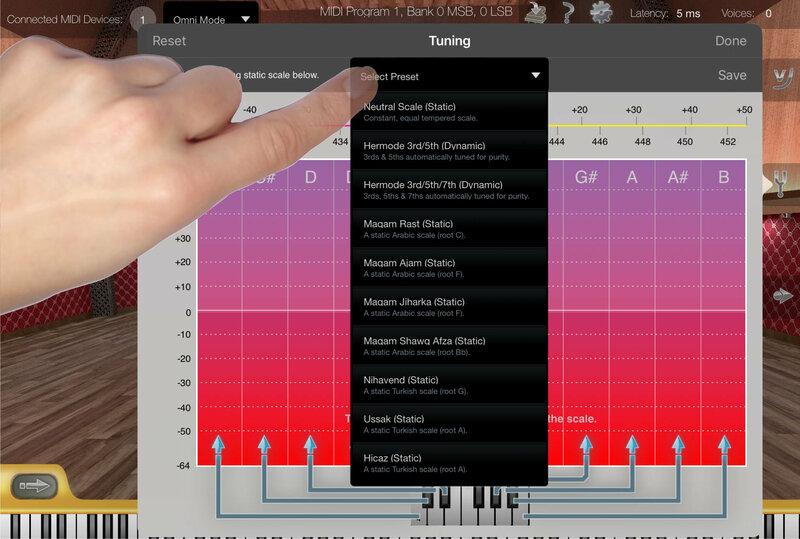 The master tune setting allows you to raise or lower the global tuning of all notes to be played. By default it is set to the common standard pitch of A=440 Hz. Dragging the master tune slider to the left will lower the app's global overall pitch, dragging the slider to the right will raise the global pitch. The master tune setting affects all notes being played, not just individual ones. Apart from changing the global tuning of all notes, you may also change the tuning of individual notes of the scale. As previously mentioned, there are two distinct approaches for scale tuning in Colossus. With static scale tuning you are tuning individual notes of a scale and this tuning of the individual notes remains unchanged while you are playing, hence static. Static scale tuning is especially required for non-western music, since they are often using different staves, that is scales where (in contrast to popular western music) the notes of a scale are not using equally distributed frequency ratios to each other. To create your own (static) scale tuning, start by selecting the tuning preset "Neutral Scale (Static)" or by selecting any other static scale preset which might be close to the scale you want to achieve. Then start to adjust the scale by simply tapping on the vertical note strips and dragging your finger downwards or upwards to adjust the tuning of the respective note. You will see that a vertical bar will follow your finger movement and you can also immediately hear the change in tuning in real-time. The second overall approach that affects the tuning of individual notes is dynamic scale tuning. 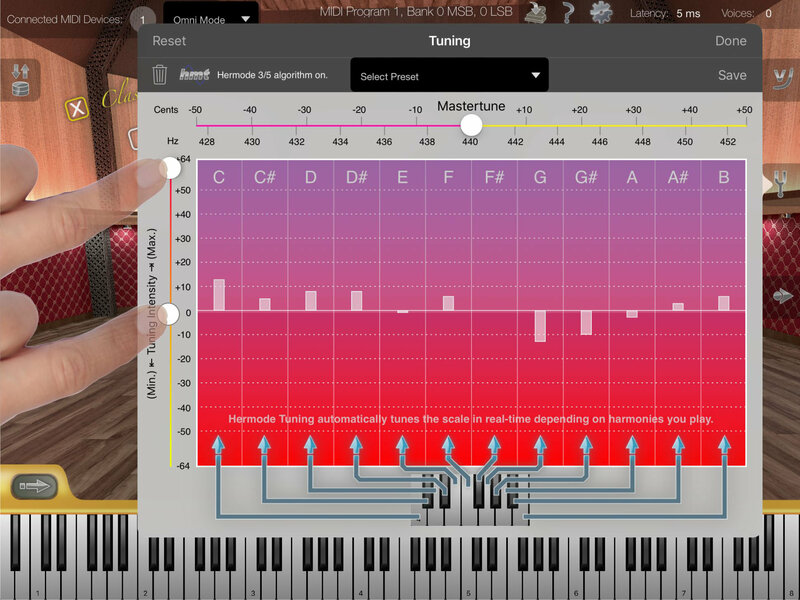 In this mode you are not manually adjusting the tuning of individual notes by yourself, instead an algorithm called Hermode Tuning is automatically adjusting the tuning of the individual notes in real-time for you, depending on which notes you are currently playing. That means in this mode you play a chord and you will immediately see and hear how the tuning of individual notes changed automatically. 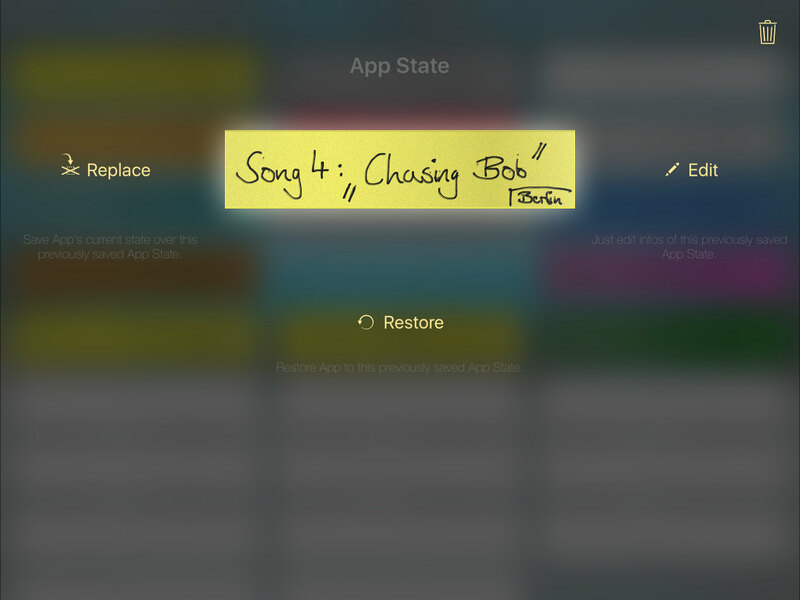 The bars of the individual notes on the tuning screen autonomously move up and down accordingly. So dynamic scale tuning (or Hermode Tuning) fulfills a completely different purpose than static scale tuning. Whereas static scale tuning is mostly intended to resemble the sound of non-western music; dynamic scale tuning on the other hand is actually intended to improve the sound of western music instead. Hermode Tuning Mode: There are currently two modes for dynamic scale tuning, which you may switch to by selecting either "Hermode 3rd/5th (Dynamic)" or "Hermode 3rd/5th/7th (Dynamic)" from the tuning presets drop down list. The two items "Hermode 3rd/5th (Dynamic)" and "Hermode 3rd/5th/7th (Dynamic)" call two different algorithms for dynamic tuning corrections. The first one controls dynamically the 3rds and 5ths to just intonation, the second one controls additionally the diminished seventh in dominant seventh chords (e.g. the F in G-B-D-F) to just intonation. 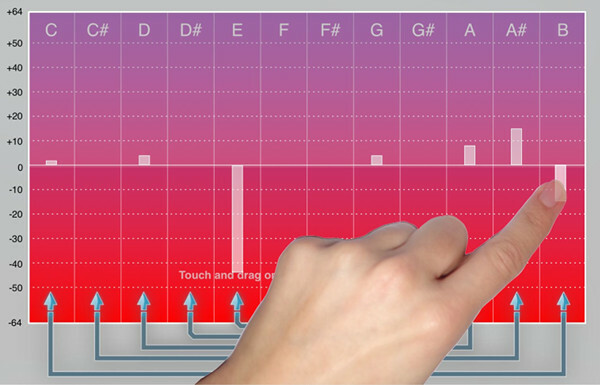 Tuning Intensity: The vertical slider on the left hand side of the individual note's tuning graph allows you adjust the impact of the dynamic scale tuning algorithm. At the slider's highest position the individual notes are corrected with max. tuning intensity. At the slider's lowest position this would result in no dynamic tuning at all, so this would behave like dynamic tuning was completely switched off, and effectively the latter would mean Equal Temperament tuning. A slider value of about 70% is recommended when making music together with additional musical instruments which are tuned to Equal Temperament. Colossus Piano comes with a number of factory presets for common tuning settings. These factory presets may lead you as a basis to quickly achieve the tuning setup you are seeking for. The factory tuning presets encompass the previously described two dynamic Hermode Tuning modes, as well as a number of popular Arab and Turkish scales. And on the very top of the preset list you find the entry "Neutral (Static Scale)" which is the default tuning setup as expected by most western musicians. Of course you can also create your own tuning presets. Simply start by selecting one of the factory presets which may come close to the setup you want to achieve, then adjust the tuning settings as previously described in this chapter. Finally tap on "Save" to save your tuning setup as a new tuning preset. You will now find your own preset in the tuning presets list. You can easily distinguish static from dynamic tuning presets; tuning presets of the former are automatically appended with "(Static)", whereas the latter presets are appended with "(Dynamic)" at the end of their tuning preset names. The amount of voices in use are displayed in real-time on the very top right of your screen. By default automatic polyphony is turned on. That means the app tries to find an appropriate maximum amount of voices for you, depending on various factors, for example the exact iPad / iPhone / iPod touch model being used, the currently selected latency setting, but also depending on whether you are using certain effects or are using Inter-App Audio mode. Because there are a variety of factors that have an impact on overall resource consumption of your device and thus the maximum amount of voices your device may handle depends on numerous circumstances. Due to this it is recommend to leave the app in automatic polyphony mode. 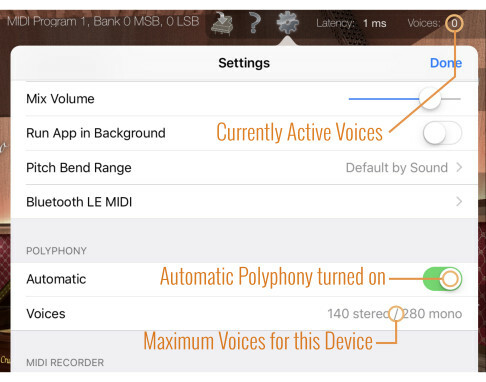 As long as automatic polyphony mode is on, the "Voices" row from the settings screen is read only, that is it will only show you the currently selected maximum polyphony as being decided by the app for the moment for you. If you encounter noise, artificial artifacts or stuttering audio while playing with the app, then the maximum amount of voices is too high. Reduce max. voices until those undesired audio artifacts disappear while playing. If you hear that notes got cut off unexpectedly or if overall sound seems to be too "thin", then you might want to increase the max. voices setting. Keep in mind that whenever you change your audio setup (i.e. when you decrease the latency setting, turn on effects or start using other apps simultaniously) this might require you to adjust your manually selected maximum polyphony setting each time. On doubt, re-enable automatic polyphony again. If you still encounter undesired audio artifacts even when automatic polyphony is turned on, then please check whether other audio apps are running in the background. And if so, stop those other audio apps from running in the background. There is always a certain amount of delay involved when playing with an electronical instrument. The time that passes between triggering a note on your keyboard and the time when you actually hear its result on your audio speakers is called latency. In a digital system - like with this app - the amount of latency is mostly defined but the digital audio buffer size the system (or app) is working with. This is configurable, and hence its latency is configurable. If the overall latency is too high (that is if the delay is too long), then it will obviously have a negative impact on your playing. On the other hand, when using a very small latency setting, this comes with a price: The digital system has to work with tiny buffer sizes and CPU usage increases substantially; not anti-proportional to the buffer size, but in fact with complex digital systems (like this app) even exponentially. As a result, the maximum polyphony that may be delivered with your device shrinks substantially with smaller buffer sizes. Almost all musicians are fine with a latency of 5ms, which in fact is already a very low latency, and which is why this is the default latency setting with this app. There are however also some very few musicians who are very sensitive to even lowest latencies of less than 5ms and such musicians might rather configure this app to a latency of 1ms instead. So as a musician you have to make a trade-off and decide by yourself what an appropriate latency is for your playing style. How much latency can you bear, how much polyphony do you need, and how much resources do you probably need for other apps running on your device at the same time. You may configure the amount of latency on the settings screen of Colossus Piano, as shown on this screen shot. On the very top of the screen you can always read the current latency of the app. 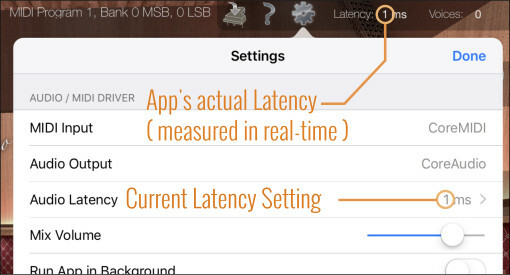 This value does not simply display the latency setting you selected, instead it always displays the real, effective latency as measured by the app in real-time. So it adds additional control whether the latency is actually the one desired by you, and whether that latency is stable (that is retaining at constant latency amount). The measured latency displayed on top of the screen, and the amount of latency configured by you may differ. This is usually an indication that your system is overloaded. In such cases iOS automatically steps back latencies requested by apps, in order to keep them at least running stable, without causing audible glitches. In such cases, check whether other apps are running in the background and stop them from running in the background. By default this app will automatically be suspended (stopped) whenever you press the home button at your iPad / iPhone, or when you switch to another app. Sometimes you may want the app though to continue running in the background, for example when you are using another app to display scores while you are playing a piano sound on your keyboard by using Colossus Piano. To do so, go to the settings screen of this app, which you can reach by tapping on the small gear wheel icon top right on the main screen of this app. At section "Audio / MIDI Driver" you find a switch called "Run App in Background". Enable this switch to keep the Colossus Piano app running in the background, even when it is not visible on the screen. You do not need to enable the "Run App in Background" setting when using this App in either Inter-App Audio mode or Audiobus mode. In those modes the app will automatically continue to run in the background, and as soon as the app is no longer used in one of those two modes, the app will automatically stop running in the background. So the mentioned setting here is just intended to control the background running behavior while using Colossus Piano as stand-alone audio app. You should disable the "Run App in Background" setting as soon as you don't need the Colossus Piano app anymore. Otherwise it will constantly reserve hardware resources and may drain your battery more quickly. An App State is a snapshot of the entire app at a certain point of time which you may save as a user preset and entirely restore at a later point. This feature allows you to save all sound settings, as well as everything you had on the MIDI recorder screen. So with the latter you may also quickly restore backing MIDI tracks which assist you during your next live song on stage. Similar features of other vendors are typically called "Set Lists" or "Performance Presets". However sometimes it makes sense to do things differently, and we did, so we also gave this feature another name. Open the App State screen by tapping on its icon on top left of the app's main screen. The actual list of App States is comprised of virtual, graphical paper strips, or "labels". Obviously you need some way to distinguish your individual App States, such that you can always remember easily which App State was saved by you for which purpose. Instead of trying to push that important information into a regular title text which you would need to enter with a text keyboard, we came up with the idea to handle this like musicians were used to before, back in the analogue days with real "set lists" for live shows: by using a pen. 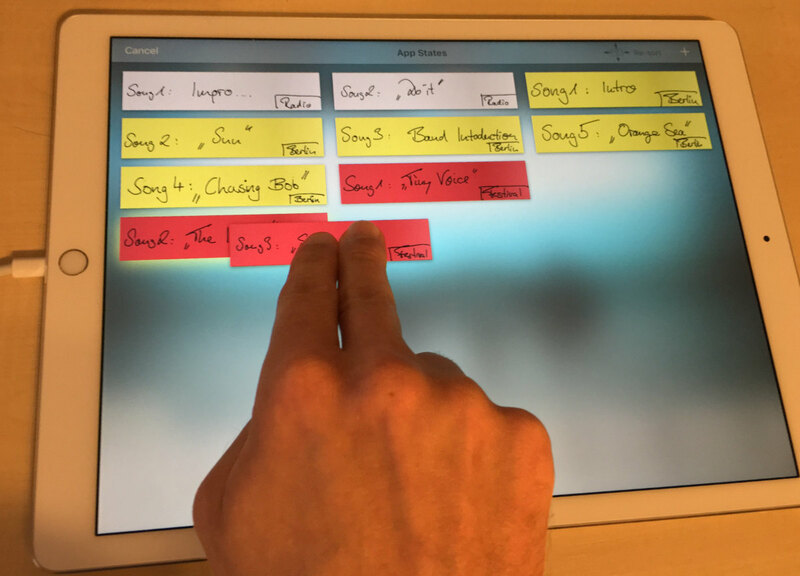 So we explicitly support Apple Pencil for allowing you to hand write and draw everything you need, and in a way you personally find appropriate to distinguish your App States in any stressful situation on stage. As you can see on the left, every App State you save is represented in the app by a rectangular paper strip which you can write and paint on appropriately. You can also assign a background color and material for each strip, so you might visually group your App States by color to visually separate them for different live shows where you perform different songs for example. To create a new App State simply tap on the "+" button which you can find top right on the App State screen. To restore, edit, replace or delete an App State, single tap on the respective App State label from the list of App States. The App State label enlarges and provides you the available options. The most important option here is the "Restore" option of course, which you will use during live shows to restore the entire app to this previously saved App State. To fine tune an existing App State, simply restore the respective App State, then go back to the app's main screen and alter the app's configuration as desired. Then come back to the App State screen, single tap on the respective label and tap on "Replace". This will overwrite the selected App State with the most recent overall configuration of the app. You don't want to use the touch screen during live performances at all? Then assign MIDI program change and bank select numbers to your App States to restore App States remotely with a tap of a button directly at your external MIDI keyboard. In case you are picking a program change and bank select number tuple which is already assigned to a factory sound of Colossus Piano, then a warning message will immediately appear below your App State's program / bank numbers to warn you that the picked numbers would cause a conflict. In case of such a conflict, your App States always have precedence over factory sounds. Refer to the MIDI Recorder manual for information about the built-in MIDI Recorder of Colossus Piano. That manual also covers all Recorder specific settings that you can find on the settings screen of this app.